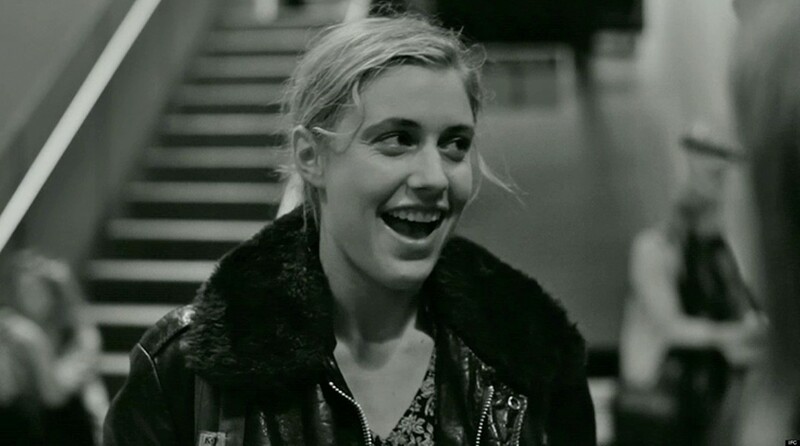 Just try not loving Greta Gerwig. Impossible. "Whoa, chillax, broseph. Come smoke a bowl." 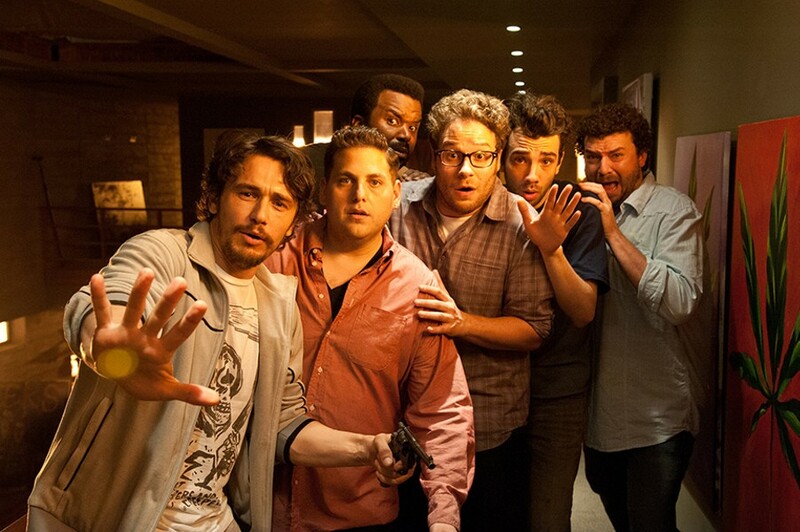 James Franco, Jonah Hill, Craig Robinson, Seth Rogen, Jay Baruchel and Danny McBride in This Is The End. FRANCES HA. The quirky, hipster ingénue is a trope that will probably last forever. From the flapper girls of the silent era through Annie Hall and Amélie, leading men have been tripping over themselves to win the hearts of girls with that certain je ne sais quoi. Frances Ha, the latest from writer/director Noah Baumbach (The Squid and the Whale) takes this theme and bends it back on itself. Frances (Greta Gerwig) is closer to 30 than 20, and she still doesn't have things figured out. After breaking up with her oversensitive boyfriend and parting ways with her best friend/roommate, she struggles to find her footing in New York City. She's broke, mildly talented and cluelessly precious. But beneath her quirkiness is a girl who's flawed and aimless. Co-written by Baumbach and Gerwig, Frances Ha is less about the boys who fall for Frances and more about Frances' need to understand herself. The plot largely focuses on the failing plutonic relationship between Frances and her best friend, Sophie (Mickey Sumner). This twist is a breath of fresh air compared to the standard romantic comedy scenarios. The film does have a romantic bent, with an ending that ties everything up neatly and adorably, but romanticism, in this case, is more of an undercurrent. Gerwig is dynamic and adorable, though her delivery of dialogue is often hit or miss. She masters the goofier aspects of Frances with ease: playful slapfights, awkward silences followed by weird noises and skipping with joyful abandon. Charismatic and dominant, Gerwig pulls you into Frances' inept, black-and-white world, making her New York your New York. Her every uncomfortable moment makes you fidget in anticipation of her next bad decision. But she eventually wins you over with giggles. Frances Ha is a short and sweet jaunt through the world of someone else's irresponsibility, which is refreshing when compared to your own irresponsibility. Baumbach and Gerwig don't bog the film down with fantastical opinions on love, or the sort of clichéd complexity usually reserved for these sorts of coming-of-age tales. Instead, they let their lead flounder, and in turn they welcome the whole audience to flounder with her. I've never floundered more delightfully. R. 86m. THE PURGE is your average story about a boy, his severed-head robot and their 12 hours of cringing and hiding from binge violence. In 2022, America has come under new political rule. The New Founding Fathers have rolled out a sweeping policy that has nearly eliminated crime and unemployment: Once a year, for one night, the country is allowed to go into a criminal free-for-all, no questions asked. Those who can afford decent protection take refuge in their well-secured homes while the poor and homeless are left to fend for themselves. The Sandin family belongs to the privileged group. The father, James (Ethan Hawke), is the lead salesman for a home security company, so their safety should be guaranteed. But when his son Charlie (Max Burkholder) gives asylum to a homeless man who's being hunted, the family's cozy life gets turned upside down. Writer/director James DeMonaco has tried his hand at action/thrillers in the past, and this is his second attempt with Ethan Hawke (they teamed up for the 2005 remake of Assault on Precinct 13, another movie about people trapped inside by other people with guns). Oddly enough, DeMonaco also co-wrote the goofy family comedy Jack (1996), which is hands-down a better film than The Purge. DeMonaco's first flaw was setting the film a mere nine years in the future. Low budget sci-fi writers always seem to overestimate the speed of paradigm shifts, which kills any semblance of believability. Perhaps DeMonaco wanted to strengthen the allegorical slant. What a wasted effort. The plot constantly lectures about the dangers of demonizing the poor. By beating this point to death (literally and bloodily), DeMonaco turn his film into a bad farce, one that makes serious social issues seem blasé and annoying. As heads of the Sandin household, Hawke and Lena Headey (Game of Thrones) give energetically tense performances. And Rhys Wakefield's "Polite Stranger" is aristocratically sinister. But the rest of the performances are as flimsy as the plot. And with such a didactic story, nearly every character serves an over-obvious purpose. Wakefield, Heady and (just barely) Hawke are the only actors able to shake off the stereotypes and provide any real thrills. The Purge might have worked better as an episode of Twilight Zone or Outer Limits, but it fails as a feature-length movie. If DeMonaco insists on pushing weak storylines then he'd be better off returning to family comedies. Fart jokes beat pointless violence every time. R. 85m. MAN OF STEEL. In 2006, the world spent $391 million to see Superman Returns, then collectively shrugged and forgot about it. Now, director Zack Snyder (300, Watchmen) tries for a grittier, more memorable reboot of the 80-year-old super-alien's mythology. Starring Henry Cavill, Amy Adams and (excited squeal) Michael Shannon as the villainous General Zod. PG13. 143m. THIS IS THE END. This stoner comedy about the apocalypse, starring (as themselves) Seth Rogen, James Franco, Jonah Hill and Danny McBride, opens Wednesday, June 12. R. 107m. Next Wednesday, the Arcata Theatre Lounge's Sci-Fi Pint and Pizza Night will feature the brilliantly titled The Brain That Wouldn't Die, a 1959 cult classic about a grief-crazed doctor who restores life to his wife's severed head — and wouldn't you know it? She hates him for it. Doors at 6 p.m.
AFTER EARTH. Skip this Will and Jaden Smith debacle and go run through the redwoods yourself. PG13. 100m. EPIC. A girl gets shrunk to pixie size, giving her a new perspective on the natural world in this CG family flick. PG. 104m. FAST & FURIOUS 6. The sixth outing has earned the cars-and-crime franchise's best reviews and biggest box office numbers. Part seven's on the way! PG13. 130m. THE HANGOVER PART III. Time to stop drinkin', fellas. The third hangover will leave you with a headache and regrets. R. 100m. THE INTERNSHIP. Vince Vaughn and Owen Wilson land internships at Google, but they're kinda old. Is that funny? Your call. PG13. 119m. NOW YOU SEE ME. A group of magicians rob banks and run from the law in this breezy, enjoyable escape. PG13. 116m. STAR TREK INTO DARKNESS. J.J. Abrams injects more action and knowing winks in this second outing in the rebooted series. PG13. 132m.